With the raising awareness of bandwidth and storage requirement in data centers and SAN (Storage Area Networking) environments, fiber companies are sparing no efforts to produce an ideal product to meet people’s needs. In this case, FS self-developed FHD series products to provide a space-saving and easy-to-manage fiber cabling situation. Let’s see FS FHD fiber optic panels, those with exquisite workmanship and help maximize the amount of connections and provide an affordable, compact solution for your network. What Are FS FHD Fiber Optic Panels? FS FHD fiber optic panels also named FS FHD fiber adapter panels (FAPs), which use zirconia ceramic split sleeves to fit specific network requirements. FHD fiber optic panels enable a quick and flexible fiber optic patch panel connections as they can snap into the enclosures easily. They are used for patching fiber cable to the termination enclosure like rack mount fiber cabinets, rack mount fiber shelf and fiber wall cabinets. FS FHD fiber optic panels are with different types, such as LC, SC, MTP fiber optic panels, multimedia modular panels and blank panels. Among those panels, LC, SC MTP fiber optic panels are mostly used ones. 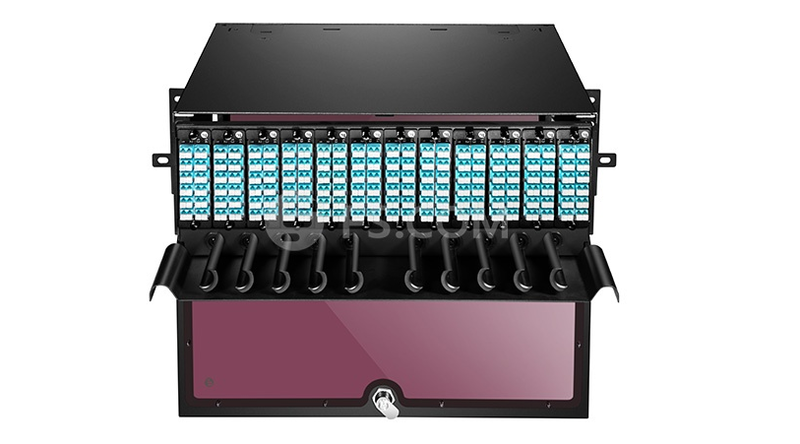 LC/SC/MTP single mode fiber adapter panels with 12 ports are very mated with 1U horizontal cable manager, they are available to install as required. You can mount the panels in FS FHD series rack or wall mount enclosures for additional flexibility and larger network system. Meanwhile multimedia modular panels allow customization of installation for applications requiring integration of fiber optic cables and copper cables. Blank fiber adapter panels reserve fiber adapter panel space for future use. Here we list the detailed information of the three main fiber optic panels for your better understanding. You can check out the chart below. FS FHD fiber optic panels are used with FHD rack mount and wall mount enclosures. FS FHD series provides a comprehensive line of solutions for fiber optic cabling. The combination of fiber enclosure and fiber optic panels can deliver the easier MACs and the flexibility to migrate to higher data speeds. Here we list three solutions for your reference. FHD-1UFCE is an unloaded 1RU rack mount fiber patch panel that can support 4 FHD fiber adapter panels up to 96 fibers. The combination between FHD-1UFCE and 4 FHD fiber adapter panels can provide a complete system solution for connectivity by installing either slack spools or splice trays inside the fiber patch panel. 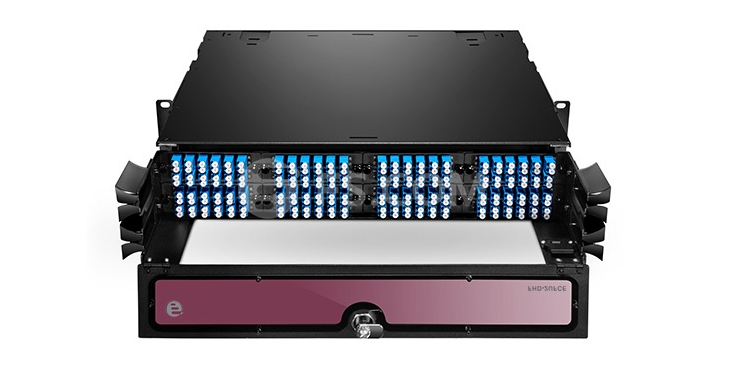 FHD-2UFCE is an unloaded 2RU rack mount fiber patch panel that can support 8 FHD fiber adapter panels up to 192 fibers. The combination between FHD-2UFCE and 8 FHD fiber adapter panels can provide higher patch field density in fewer server rack units saving valuable space by installing either slack spools or splice trays inside the fiber patch panel. FHD-4UFCE is an unloaded 4RU rack mount fiber patch panel that can support 12 FHD fiber adapter panels up to 228 fibers. It assures flexibility and ease of network deployment and moves, adds, and changes. FS high density FHD fiber optic panels preloaded with fiber adapters that serves as the intermediate connection between the backbone and your patch cable, provides an affordable, compact solution for your network. In addition to FHD fiber optic panels, FS also offers FHD fiber enclosures, fiber patch panels and fiber cassettes for your assembly to free you from network problems. For more information about FHD fiber cabling solutions, you can visit FS.COM. I’m sure your problems will soon be solved. This entry was posted in Cable Management and tagged FHD Fiber Optic Panels, LC FAPs, MTP FAPs, SC FAPs on November 22, 2018 by Admin.